These bone broth soup recipes will change the way you make soup! The foundation for any great soup or stew is a flavorful, wholesome broth — and there’s no better foundation than bone broth! The difference between stew vs soup is pretty minimal, and you can use a bone broth recipe as the base for either. It comes down to the cooking process. Soup is any combination of vegetables, meat, or fish cooked in liquid. A stew is any dish that’s prepared by stewing, in which the food is slightly covered with liquid and simmered for a longer period of time in a covered pot. While it’s a main course all on its own, bone broth can also easily be turned into a delicious soup or stew for a quick and easy main dish any night of the week. Hearty dishes, from creamy tomato to chicken noodle, can be instantly amplified and enriched with the addition of slow-simmered bone broth as one of the main ingredients. The benefits of purchased or homemade bone broth are many. Adding bone broth is a wholesome boost to any recipe. 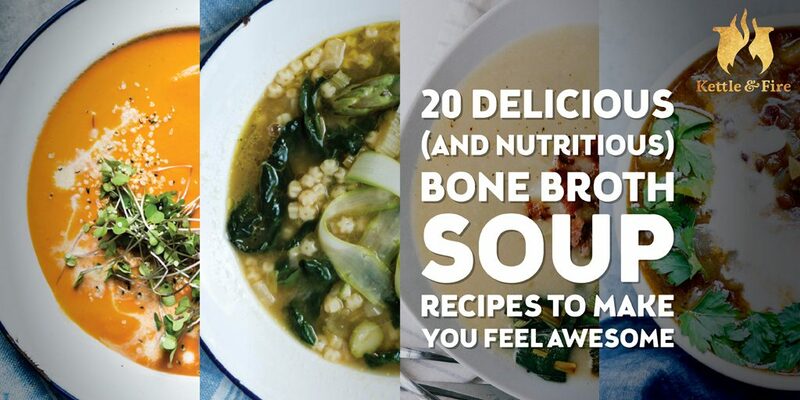 Try adding one of these 20 delicious bone broth soup recipes to your regular rotation of wholesome favorites. Nothing says home like a warm bowl of creamy tomato basil soup topped with cheddar cheese on a cold winter day. The canned stuff is woven into the fabric of childhood in the United States, alongside the melty grilled cheese sandwich to dunk into it. This delicious tomato basil soup recipe is a nod to traditional foods, while also satisfying your adult taste buds by offering fresh ingredients. This recipe uses fresh produce instead of canned tomatoes and dried basil. It also includes coconut milk instead of heavy cream to make it creamy. When cooked at home with a ready-made bone broth, traditional chicken tortilla soup can be an easy, delicious, and wholesome alternative to this favorite recipe from Mexican restaurants. The secret is lots of fresh lime and crispy baked tortillas. That’s what makes this one of those tasty recipes that will keep you satisfied time and time again. Coconut milk, bone broth, and a hint of turmeric-tinted curry make this creamy tomato soup a dairy-free version of the classic that’s sure to become one of your new favorite homemade tomato soup recipes. In addition to the benefits of turmeric and bone broth — including support for joint and digestive health — this tomato soup recipe calls for more vegetables, including red bell pepper and carrots, to add a slight sweetness, and more nutrients, like vitamin C.
A “wholesome” potato leek soup might seem like an oxymoron, but this recipe tweaks a few key ingredients in the classic comfort food to create a better option than the one Grandma used to make. This version remains a satisfying and delicious recipe while hiding better-for-you ingredients in the soup pot. Traditional potato leek soup typically includes russet or yukon potatoes, heavy cream, and butter. It’s also typical in most recipes that the green part of the leek (the part where most of the vitamins and nutrients reside) is tossed in the compost. Not so in this version! Like spring in a bowl, this leek, fennel, and asparagus soup recipe relies on avocado to add all that creaminess and good fat, while Kettle & Fire’s Chicken Bone Broth adds protein and a dose of nutrients. Fresh thyme adds another layer of tang, while a squeeze of lemon at the end brightens the whole dish up. It’s one of those recipes that you won’t be able to get enough of. Butternut squash soup is a rich, creamy comfort food that’s often loaded with milk or heavy cream and butter. This twist on a classic uses full-fat coconut milk and ghee instead, giving you the same rich experience without the lactose. Smoky, smooth, and just a bit spicy, this black bean soup reinvents the American classic bean stew with a little Southwestern kick. Packed with flavor, this hearty and filling soup is the perfect dish. Black beans are a natural source of dietary fiber and protein with little fat. They’re also a source of folic acid and magnesium, as well as potassium and iron. And because they’re so rich in flavor, there’s no need for additional ingredients like ham or bacon. Leek, asparagus, and kale cooked in a nourishing bone broth and topped with a peppery arugula pesto all come together in this great Italian recipe to make a springy green minestrone soup. This recipe ups the flavor and nutrient content of this already delicious soup with greens, collagen-containing Kettle & Fire Chicken Bone Broth, and a hearty arugula-and-walnut pesto that brings out all the flavor. Tender bits of shredded chicken cooked in coconut oil and bone broth are the highlight of this chicken soup recipe. Sweet leeks, green peas, and chives make it a perfect spring soup that’s light yet satisfying. The addition of brown rice makes it a heartier version of a classic chicken noodle soup. You could use split peas instead of green peas, if you prefer. If you’re in search of a great recipe with sweet potatoes as the main component that’s not sweet potato fries, baked sweet potato, or sweet potato casserole, this sweet potato soup recipe is for you. Made with just 10 ingredients by slow-cooking on low heat, this sweet potato soup will amaze you — it is creamy, quick, and delicious! Topped with crunchy bacon bits and full of cheesy goodness, this broccoli cheddar soup is a keto-approved comfort food that’s sure to satisfy your taste buds — and your macros. This keto broccoli cheese soup recipe is pretty darn close to the classic version, but without the addition of flour, corn starch, or potato starch (which some traditional soup recipes use for a thicker soup). It is also gluten-free. Spicy, pungent kimchi is the secret ingredient in this wholesome cabbage soup recipe that’s loaded with flavor. Made with fresh and fermented cabbage, this delicious recipe is low in calories and contains important dietary fiber. The combination of fresh garlic cloves, ginger, soy sauce, and sesame oil make it like a stir-fry comfort food in hearty soup form, and browning a little ground pork makes it a filling main meal. In any corner of the world, lentil soup is a filling, delicious, and nutritious staple. Upgrade it with a little Kettle & Fire Chicken Mushroom Bone Broth, and it’s more than just a hearty soup — it’s a delicious powerhouse of a soup. Made with pantry staples and fresh produce like onions, carrots, and celery stalks, this delicious lentil soup is a main dish that’s perfect for an easy weeknight dinner that doesn’t take a long time to cook. Smoky, smooth, and surprisingly light, this quick and creamy cauliflower soup is low in calories, carbs, and saturated fat, but high in flavor. This recipe is like a lighter, leaner version of potato soup. And thanks to the addition of Kettle & Fire’s collagen-containing chicken bone broth, it also contains protein and essential minerals. Tangy tomatillos, mild green chiles, and chicken cooked into a mushroom-infused bone broth — what could be more comforting and satisfying than a chile verde soup? Tomatillos, also known as green tomatoes, are considered a staple in Mexican cooking. They’re often used to bring a tart and refreshing bite to soups and salsas. Tomatillos are a source of fiber, iron, niacin, potassium, and manganese. They also contain vitamin C, which is known to support your immune system. 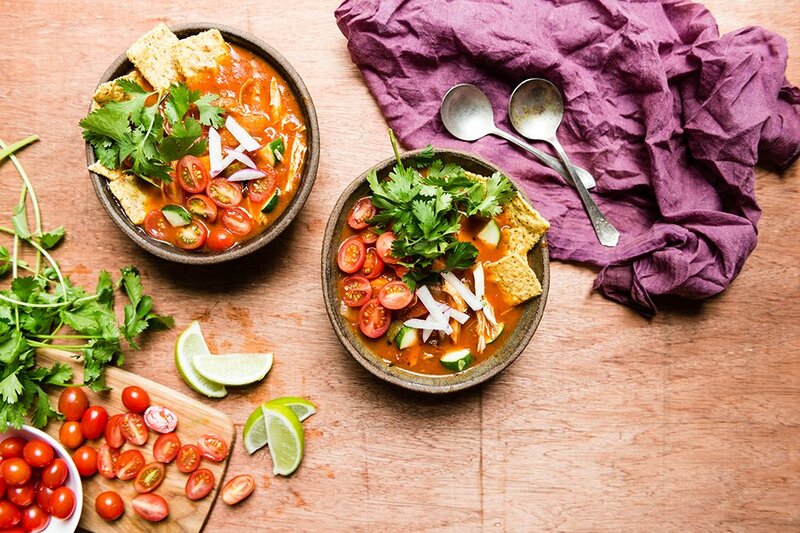 With a tomato base, hearty vegetables and lots of cilantro, chicken tortilla soup is good for the soul and full of mouthwatering aromatics. This version simply expands on the classic with a good dose of chicken bone broth. This classic Vietnamese soup is already rich in antioxidants, vitamins, and minerals. And with the addition of beef bone broth, you get even more benefits thanks to the unique protein, collagen. This is an upgraded version of classic chicken noodle soup made with chicken bone broth instead of regular broth or stock. Fat noodles and lots of great veggies make this a hearty soup the whole family will enjoy. This pumpkin soup recipe is quick, nourishing, and incredibly easy to make — without skimping on flavor. This recipe blends aromatic spices like ginger, garlic powder, cinnamon, and nutmeg to bring the essence of fall into your soup mug. When you’re not enticed by hot soup during the heat of summer, try a chilled gazpacho recipe instead. This bone broth gazpacho with cilantro chimichurri offers an exciting recipe using summer vegetables in a cool, refreshing way. It’s one of our favorite bone broth soup recipes! If you don’t want to learn how to make bone broth soup recipes or can’t find the time to do so, Kettle & Fire has you covered! We’ve reinvented the classics with our ready-to-eat bone broth soups. We took classic tomato soup and gave it the signature Kettle & Fire makeover using our chicken bone broth as the base. Then we added organic tomatoes, apple cider vinegar, olive oil, and spices to a large stock pot, and finished it with a little coconut milk to create the ultimate, comforting, creamy blend. Using our collagen containing chicken bone broth as the base is just one of the ways we jazzed up a standard butternut squash soup recipe. We then added creamy organic coconut milk and aromatic herbs and spices to make it the best bone broth soup recipes you’ll ever taste. We tinkered with a traditional miso soup recipe and gave it a twist of our own. Our miso bone broth soup has the same great umami flavor but with added nutrition thanks to Kettle & Fire Chicken Bone Broth. We’ve slow-simmered all the traditional ingredients together in a Crock-Pot — ginger, garlic, seaweed, onion, and miso paste — to create the most flavorful miso soup there is. Whether you make your own soup or stew or choose a ready-to-eat option, any meal can be instantly upgraded with the addition of slow-simmered bone broth. The foundation for any delicious soup is broth — so why not use delicious and wholesome bone broth? The statements made on this website or email have not been evaluated by the FDA (U.S. Food & Drug Administration). The products sold on this website are not intended to diagnose, treat, cure, or prevent any disease. The information provided by this website or this company is not a substitute for a face-to-face consultation with your physician, and should not be construed as individual medical advice. Consumer reviews, testimonials and opinions are based on the experiences of individual Kettle & Fire consumers. Kettle & Fire is not suggesting that any individual consumer’s experience with our products is representative of the experience of others. These testimonials are voluntarily provided and are not paid for or offered in exchange for free products..